For fifty years, the vast majority of Roman Catholic priests and theologians have been forced into a reluctant silence when it comes to birth control, celibacy of priests, indulgences, ordination of women, and homosexuality. I myself, while teaching in Roman Catholic seminaries for twenty-five years, was required to keep a guarded silence on all these issues. But this reluctant obedience has not served me nor has it served those whom I helped prepare for lay and ordained ministry. In turn, as I Catholic theologian, I have not served you [the present reader] by my complicity in keeping silent. As Fr. Helmut Schüller, the charismatic founder of the Austrian Priests’ Initiative, says, “Obedience has been overrated. The times require of us that we speak out.” Hence, 425 priests joined together in drafting their “Appeal to Disobedience” in which they pledged to God and to his people to bring about urgently needed pastoral changes in the Church that the Austrian bishops were unwilling and unable to support because they owe their first allegiance to the Vatican. By way of atoning for my years of silence, I have prepared this book in order to equip my former students and all those faithful Catholics who are interested in sorting out the wheat from the chaff within current Catholic teaching. What you discover herein will supply you with clear, strong, and compelling case studies that can be used to open up informed and reliable explorations on topics that have largely been obscured by authoritative pronouncements, by shoddy biblical scholarship, and by ignorance of Catholic history. Whether you want to speak to your teenage daughter or to your bishop, these case studies will offer talking points that will enable you to make sense out of the faith that is intended to nourish us, to make us free, and to draw us into harmony with the mind of Christ. For those who are confused by claims and counter-claims, this book will offer powerful tools for reconsidering the issues and for engaging church leaders to do the same. Blind obedience may be suitable for children; adult faith requires much more. Thorough and logical presentation, presented in language accessible to the general reader. The question and answer sections are very helpful. I particularly like the lists of resources in each chapter, a boon to those who want to go further into the topics. A fine job of explaining the historical context and the ways of life in the various periods covered. Scholarly without being dry. Well worth the read for anyone who wants to understand some of the important issues in the Church today and how they came to be as they are. I'm a Protestant with an interest in contemporary Catholicism, and Milavec taught me a great deal. 5.0 out of 5 stars I love "outside the box" reading! What a refreshing read! To have the knowledge and the ability to explore, question, and totally step outside the comfort zone of our self-imposed box to bring forth such enlightening information. Why should we, as Catholics, be spoon fed and blindly accepting of our religious teachings? I am certainly not a critic by any means, but I thoroughly enjoyed reading this, digesting the text as though it were a delicious Irish pumpkin scone, leaving no crumbs of information unread. The Church lives in a challenging time. The modern world in which we live throws up questions that confront ancient Catholic beliefs and practices. Milavec should be applauded for frankly exposing the problems. 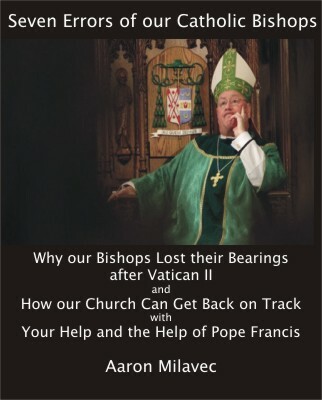 Reform can only come about by laity, priests and bishops clearly recognising what has gone wrong. Only an appreciation of the real issues at stake and the root causes of the Church's slow response to change can lead to permanent improvements. Church reform is also about guiding an educational process, a therapeutic healing, a new pastoral reorientation. Milavec understands that on every level people are involved: human believers who suffer from misguided instructions, human leaders who suffer from underdeveloped social skills. Milavec's book opens eyes, minds and hearts. If you know anyone who would appreciate a book like this, please consider forwarding them a link to this page=https://payhip.com/b/trB7, or better yet, forwarding to them your review.